My friend Lisa from The Red Thread is such a clever thing. I've written about Lisa's SushiBird Tiles and her Sweetie Petites before and now there are two new gorgeous sewing patterns to add to the OK, Let's Sew! collection. The Ooshka Babushka doll pattern makes a doll 41 cm tall - great for cuddling or as a pillow. Ooshka Babushka Pattern Kits include a gorgeous face panel printed on linen/cotton blend fabric, a sewing pattern and instructions. You can choose from a cute blonde, redhead or dark-haired doll, and there are instructions for an applique face if you want to create your own. 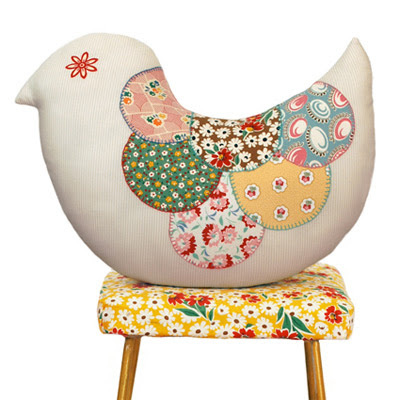 The Hello Birdie pillow pattern makes a generous 44 cm x 34 cm bird with quilt-like feathers. And if you're not the sewing type, keep an eye out on The Red Thread website as finished pillows will be available to purchase soon. You can find these OK, Let's Sew! patterns and kits on The Red Thread website and at various stockists around the world. If you're in Sydney this weekend, you can also find them at the excellent Mathila's Markets in Riverview on Sunday from 9am - 1pm (look for The Red Thread stand). See you there! I agree, Lisa is very talented. I love her Sweetie Petites - I had lots of fun making them with my 6 year old daughter. The Ooshka Babooshkas are great for a more challenging and bigger sewing project. Great to see you yesterday, Steph. Looks like you have hit your stride in Sydney town! All the best, Vanessa O'Sullivan x.